What do American troops and man’s best friend have in common? Every day they give us their best and, here at Green Butterfly Brands, we give back our best. When you purchase treats with us, U.S. veterans receive a portion of your purchase to train service dogs and your pup receives the tastiest high-quality treats on the market! Approved by THOUSANDS of canine customers and our own quality control crew, Mr. Bear and Demoiselle, we know that real beef is the only beef your pup should be eating! 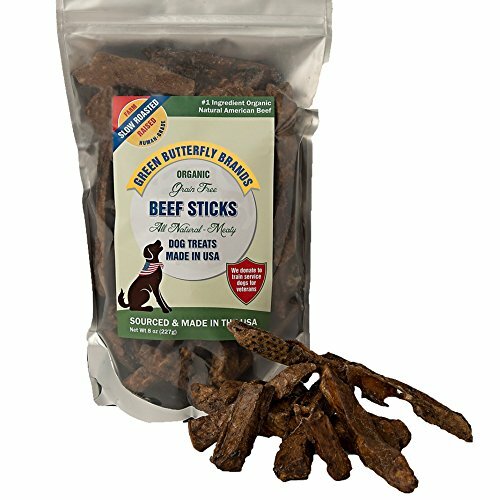 Our drool-worthy meaty Beef Sticks contain human-grade beef that you can be confident when feeding to your furry family. We guarantee no additives or preservatives, and 110% slobery SATISFACTION from your furry friend. If one taste of our flavorful, fresh Beef Sticks doesn’t make your dog do a little dance (you know the dance), we’ll refund your purchase. Support our troops and support small businesses by simply purchasing from your friends at Green Butterfly Brands!